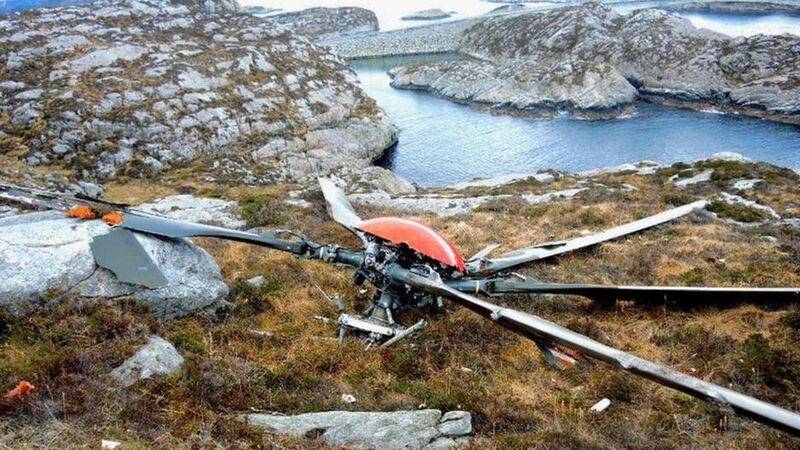 A report into a fatal helicopter crash off Norway has said there is no explanation as to why a detection system did not spot signs of damage to the gearbox. 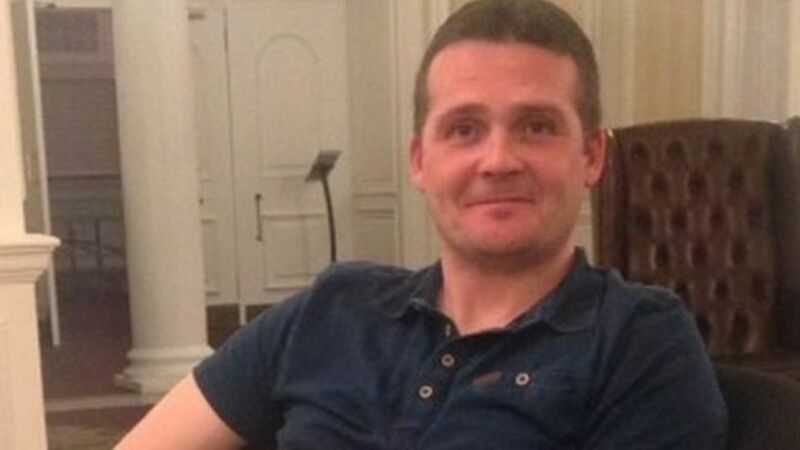 Iain Stuart 41, from Laurencekirk, Aberdeenshire, was one of 13 people who died in the crash last April. The Accident Investigation Board Norway said the inquiry was continuing. The AIBN said a fatigue fracture in the gearbox led to a chain of events which resulted in the rotor becoming detached from the fuselage, which then hit an island and burst into flames. In 2009, a Super Puma crashed off Peterhead, leaving 16 men dead. An inquiry into the 2009 North Sea crash concluded that the accident could have been prevented. All on board died when the Bond Super Puma came down. Sheriff Principal Derek Pyle said after a fatal accident inquiry that precautions which might have avoided the deaths included following agreed procedures and communications. Friday’s AIBN report said many people witnessed last year’s crash. They included a couple with a four-year-old child who were crossing a nearby bridge on foot when they heard the helicopter. It said: “A loud bang was then heard from the helicopter and the rotor detached. The husband stopped, whereas his wife and child continued walking. “The helicopter continued virtually straight above the bridge and the husband could see that it was yawing as it moved through the air. “He saw dark smoke coming from the helicopter as it continued until striking the island to their southeast. The rotor came straight towards the bridge and was perceived as dangerous until it suddenly changed direction and continued north. Another person saw the helicopter approaching before he heard a metallic sound and the rotor detached. He described it as an “explosion in the sky”. The helicopter then fell to the ground and burst into flames. Super Puma manufacturer Airbus said the investigation showed there were mechanical similarities between last year’s accident and the one seven years ago, which they were not aware of at the time of the Norwegian crash. Airbus said it had now taken protective measures that it could not do after the earlier crash based on the knowledge and evidence available at the time, and also because significant parts from that accident were never recovered. The European Aviation Safety Agency (EASA) said: “While the accident investigation is not complete, EASA continues to implement robust and proven certification processes taking into account all available information. A CHC Helicopter spokesman said: “The report confirms the progress made to date in establishing a definitive root cause. We remain fully committed to supporting the AIBN’s ongoing investigation. “As we mark the first anniversary of the tragic accident in Turøy, our thoughts remain with the families and friends of those who were lost. He added: “In both Norway and the UK, the regulators continue to have in place operational directives that effectively prohibits the use of these two models. Our global position mirrors this approach for now. For the ‘people in the back’ helicopter travel remains the single most important issue in terms of health and safety for offshore workers today. When it comes to one particular aircraft, the Airbus 225, the people in the back have been expressing some strong views and most of them blunt, few want to fly in the 225 again! The horrifying image from last year’s tragedy of the rotors spinning through the air with no cabin attached will live long in the minds of workers and their families. This message has been made abundantly clear by the Trade Unions in the Offshore Coordinating Group (OCG) to regulators, manufacturers and industry. The CAA, the European Aviation Safety Authority (EASA), the Norwegian CAA, Oil and Gas UK, Government, all interested parties have been told we are acutely aware of the continuing concerns and lack of confidence workers across the sector have in helicopters generally, and not just the 225s. However, when it comes to the Super Puma type the facts are stark; we have seen this aircraft type in the sea six times since 2009 with the loss of more than 30 lives. This alone makes any future proposal for a return to service extremely difficult and will cause considerable concern for workers. The investigations continue into the Norwegian tragedy and as yet we have no certainty over a root cause, which must be a pre-requisite before even a discussion could take place about this aircraft. The OCG has made it equally clear to all parties; we will continue to defend the workforce position and will not accept any return to service without the support of the offshore workforce. In this respect we believe the oil companies and contractors across the sector must play a significant part and take cognisance of the ‘people in the back’, their employees, as to ignore their views on this issue could irreparably damage reputation, culture and industrial relations. Jake Molloy : vice-chair of the Offshore Coordinating Group. After a spate of accidents occurring over several years involving two Super Puma variants (the EC-225 and the AS332-L2), many within the industry raised doubts as to the long term safety of the aircraft. These doubts were reaffirmed on the 29th of April 2016, an EC-225 experienced a detachment of its main rotor blades during flight. 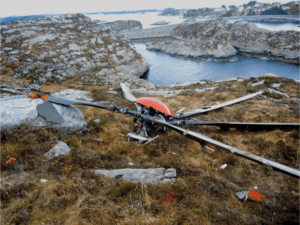 The loss of main rotor blades sent the aircraft body plummeting through the air before crashing into rocky ground near Turoy Norway. All 13 on board were killed in the accident. 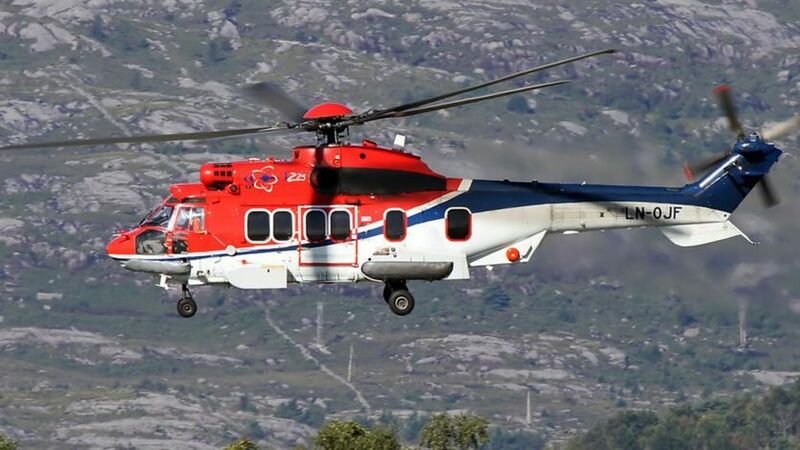 In response to the Norwegian accident, the European Aviation Safety Agency (EASA) grounded both EC225 LP and AS332-L2 variants of the Super Puma indefinitely to allow detailed investigations to take place. With provisional findings communicated and modifications made to the aircraft, EASA lifted its ban on the aircraft on the 7th of October 2016, but UK and Norwegian Aviation Authorities opted to keep national bans in place until the investigation reached a later stage. A preliminary report into the accident is expected in the coming weeks. Many offshore workers have expressed their concerns, with the issue causing a backlash within the oil and gas community, that the aircraft may soon be returned to service. Oil and Gas People surveyed 2,500 people within the industry to canvass attitudes towards a potential return to service. In response to the on-going controversy regarding the potential return to service of the Super Puma EC-225 and AS332-L2 variants, Oil and Gas People – the oil industry’s largest oil and gas jobs and news site – have conducted a survey of 2,500 oil industry workers. The survey aims to capture the mindsets and opinions of the workers flying offshore on a regular basis and gain consensus on their attitude towards the potential reintroduction of the Super Puma fleet. Oil and Gas People’s survey concludes that the vast majority of offshore workers opposed the return of the Super Puma variants – with 90.1% advising they would not be happy to see the aircraft return to service. The remaining 9.9% were happy to see the aircraft return to service. Workers were then asked if they would refuse to fly on board the Super Puma variants should they be brought back into service – of which 65.5% advised they would refuse to fly. The remaining 34.5% would not object to flying in the aircraft. When asked whether travelling in the Super Puma would cause concern or worries for themselves 88.5% advised travelling on board a Super Puma would indeed cause them concern. 7.86% advised they would have no concerns and 3.7 advise they weren’t sure. Upon being asked if traveling in the Super Puma would cause concern or worries for family members, 89% advised travelling on board a Super puma would cause their family concern or worry, 6% advised it would not and 5% advised they were not sure. Offshore workers were also asked if anything could be done to restore their faith in the Super Puma – over 85% of respondents advised that there was nothing that could be done to change their mindsets. Some of the remaining 15% advised that they simply had never lost faith in the aircraft in the first place, and others who stated their mindset could be changed suggested a re-design of the the main gearbox and a safer seating configuration to give passengers more room and allow quicker evacuation in the event of an emergency. One year after the fatal crash of an Airbus Helicopters H225 (EC225 LP Super Puma) operated by CHC near Turoy, Norway, investigators from the Accident Investigation Board of Norway (AIBN) are still trying to fathom why a crack initiated in the main rotor gearbox (MGB) and how it propagated. After the in-flight breakup of a CHC-operated Airbus Helicopters H225 near Turoy, Norway, the main rotor was found on a small island. The AIBN also confirmed “many similarities” with the MGB failure that led to the fatal crash of an Airbus Helicopters AS332 L2 (G-REDL) off the coast of Peterhead, Scotland, in 2009. The investigation has shown that the crash on April 29, 2016, which resulted in the deaths of all 13 people on board, was the result of a fatigue fracture in one of the eight second-stage planet gears in the epicyclic module of the MGB. The fatigue had its origin in the upper outer race of the bearing (inside of the gear), propagating towards the gear teeth. The crack initiation appears to be a surface micro-pit. However, the AIBN does not yet understand why the micro-pit formed and how and why the crack continued to grow sub-surface, thus preventing detection. No material conformity or manufacturing issues have been revealed during the investigation. As previously revealed, the MGB had been involved in a road accident during transport in 2015, but the AIBN said it found no connection with the crack. As to the similarity with the 2009 accident, the AIBN notes there was one warning of possible gear fracture in that case. Unfortunately, the actions taken did not recognize the degradation of the second-stage planet gear, which subsequently failed. It said there was no advance warning before last year’s crash. The AIBN said it will continue metallurgical examinations and seek to understand the underlying driving mechanisms of the fatigue fracture. This includes studying the recently salvaged second-stage planet carrier with the inner race from the fractured planet gear. The investigators, however, say they cannot estimate a completion date for the final report. Meanwhile, in a statement issued following the release of the report, Airbus Helicopters CEO Guillaume Faury said the company was not aware of any issue related to the 2009 crash at the time of the Turoy crash. “The information available to us from the 2016 accident has allowed us to take protective measures that we could unfortunately not have put in place in 2009 based on the knowledge and evidence available at the time, and also because significant parts from the 2009 accident [aircraft] were never recovered,” he said. Faury added that Airbus was “totally committed to transparency” in all matters regarding aviation safety and international helicopter regulations. Offshore helicopter health & Safety is no accident through the offshore trade unions demand the highest standards in safety and training are implemented and adhered to by all stakeholders within the UKCS also call on and lobby the UK and European safety regulatory bodies to maximise protection all who work, fly and travel in the offshore helicopters. If you are not already a member of an offshore trade union can you afford not to be a member? Since our 225 Update Summit on 28th February 2017 in Aberdeen CAA has continued to work closely with CAA NO, EASA and Airbus. The AIBN plan to issue a preliminary report on their investigation on the 28 April 2017 as part of their Norwegian legal obligation to report within one year of an accident. The report is comprehensive (101 pages) and provides significant detail. No new information for the CAA has emerged from the report and there are no safety recommendations. You should recognise most of the technical content / issues from our last meeting and earlier conversations. It is possible that the ‘final’ report published next week will have changed as a result of comments so we will review the document again following publication. The report highlights the difficulty in accurately carrying out the oil cooler inspection, but the work that Airbus has done and are currently doing to introduce a new Full Flow Particle Monitor (FFPM), better known as the Eaton ODM system looks very encouraging and should be approved and available in the next few months. It is our understanding that this will offset the need for the AD oil filter and cooler checks. CAA UK, CAA NO and Airbus met on 20th April 2017 as part of an update and information exchange. A further meeting is planned at Airbus on the 4th May 2017 and this will include EASA. CAA UK and CAA NO continue to work closely on agreeing the next steps required to be sufficiently satisfied in order to remove our Operational Safety Directives. Developments on the lifing and the detection capability look promising and we are hopeful that after obtaining further information we will be closer to removing our directives. At this time however the directives remain in place. The biggest offshore union has accused employers of ‘spin over substance’, as it took another step towards industrial action. Unite the union today (Tue 25 Apr) served notice on the Offshore Contractors Association (OCA), informing them that it was going to ballot members for official industrial action. Unite regional officer John Boland said: “Our members are growing angry over the behaviour of the OCA employers. Last week, we went to talks with them at ACAS, and they told us that they didn’t have the right people there to negotiate, and asked us to explain our pay claim – even though they’ve had it for months. They then had the brass neck to issue a press saying they were disappointed with the outcome. “Today, they have put out another press release saying they ‘remain willing’ to implement a 2 per cent pay increase. That’s the pay increase that’s already been overwhelmingly rejected by our members, and that would see them suffer a real-terms pay cut. Unite’s offshore members are in the middle of a long-running dispute over pay and conditions with the OCA. In March, 81 per cent of Unite members voted to reject the latest deal put forward by the employers. For further information or comment contact Unite regional officers John Boland on 07918 630435, or Tommy Campbell on 07810 157920. If you work offshore and are employed by one of the OCA contracting companies and not yet a trade union member, can you afford not to join? The biggest offshore trade union is to push ahead with preparations for an official ballot on industrial action. Offshore members of Unite the union are in the middle of a dispute over pay and conditions with their employers, represented by the Offshore Contractors Association. Today (Wed 19 April), representatives of Unite met with the independent conciliation ACAS. Officers from ACAS also met with representatives of the OCA. After the meeting, Unite confirmed that it will continue with preparations for official industrial action ballots. In March, 81 per cent of Unite members voted to reject the latest deal put forward by the OCA.